According to research cited by Lori Lowe for the book "The Normal Bar" in which over 70,000 couples were surveyed to identify relationship "secrets" it was found that 29% of women desire more romance in their relationship. To me that isn't surprising. 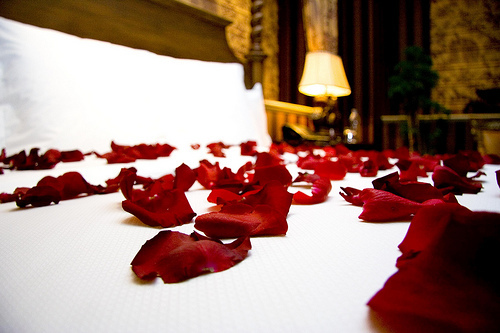 What is surprising is that 44% of men desired more romance. As I thought about this I realized that this is probably true for my marriage as well. I know that my wife enjoys romance and romantic dates and activities and so I try to plan and carry them out because I know that is what she wants and I want her to be happy but often I overestimate how much romance she expects. I put pressure on myself to make every date and every get-away romantic and that is simply unnecessary. I need to do a better job discussing with Cami what she actually wants; when I have done this in the past I've found that often she would rather just have fun with me or take a nap. She loves naps. The other problem I find myself struggling with is the stereotypical idea of romantic. A room at a bed and breakfast with rose pedals all over the bed, chocolate covered strawberries on a silver platter on an antique table in the corner, the sun setting in the window just as you enter the room... you know what I'm talking about. We see a variation of this in nearly every romantic comedy (at least in the ones that my wife picks out). Often a stroll around the block we live on together, holding hands of course, is all the romance that is needed. 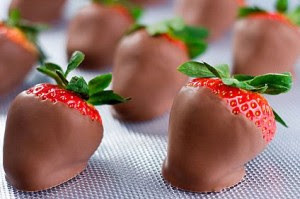 Although I will admit that chocolate covered strawberries seem to make everything better for my sweetheart. ﻿﻿﻿﻿﻿﻿﻿﻿﻿﻿To sum up: I put too much pressure on myself to make everything romantic and I blame television and romantic comedies. That being said, romance is important the key is identifying when and how much. I want to thank Lori Lowe for conducting this research. Her website, www.marriagegems.com, contains other gems that she has discovered about marriage. I encourage you to check it out. I've also linked up with the From House to Home link party. You work so hard on your relationship, Tyson! I'm always inspired by your sacrificial attitude towards your wife. But I agree, that maybe all that "romantic sounding stuff" might not even be what your wife desires. Asking her sounds like a perfect plan and reminder to all of us to start asking those key questions of our spouses. We can all raise the bar! Thanks for your support Beth. There's nothing more important than my wife and my marriage (the kids come in a close second).